I've had a request from an anonymous reader to post something related to the late, great St. Mary's school on Franklin Avenue. This photo is from June 1984. It's all the kids from St. Mary's returning for Mass before they graduated from high school. Sr. Agnes is on the left, Sister Ellen on the right. I distinguished myself at Mass by almost passing out and having to briefly leave the church. Afterwards, Sister Ellen walked over to me. I was wondering if I was still eligible for a swat since I was technically on school grounds. She just winked at me, smiled, and said, "Too much partying last night, Mr. Young?" 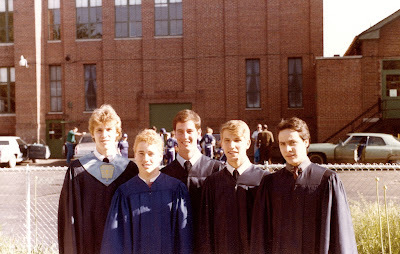 (Left to Right) Joe Serna (shaming us with his National Honor Society sash), Robert Hurley, Duane Gilles, Gordie Young (with a horrible "new wave" haircut), and Michael Kennedy. 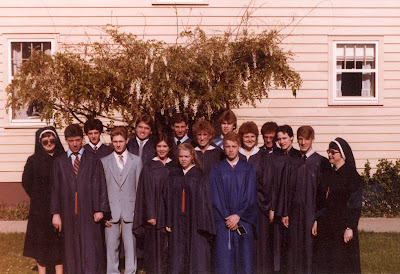 I was a lowly 10th grader at Powers in 1984. I remember those faces. It is so cool that you all went back for Mass together. I don't think our Holy Redeemer clan was as cohesive although we say one of these days we are gonna have a Redeemer reunion. That is one of the things I so miss about Flint. The Catholic community in Flint was so strong without being pushy or trying to assimilate into modern Christianity. 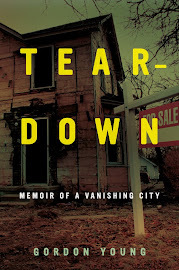 Here in the South, you would NEVER find a parish like any of those from Flint back in "the day". I miss that. I miss that there were nuns who knew you and your family all the way up to your grandparents. And the Catholic Church was what is was, it wasn't trying too hard. That may sound weird to those of you who haven't moved from the North, West or East, but if you have lived in the South and found a Church like St. Mary's, St. John's, Holy Redeemer - you are lucky. Two years ago I was able to get into the school and gym. I went to St. Roberts, but we played K of C league games at St. Mary's gym. Brought back many memories. I was surprised to see much work was being on on the school section? Looking into the trophy case I saw many pictures of classmates from Powers. It is easy to forget how many students St. Mary's sent to Powers. The area around the school is just terrible. Very depressing.